What's the "non-billable" option for? This option allows you to define that some jobs don't have to be included in any invoices. Jobs can be defined as “non-billable”, meaning that no income estimate will be calculated and that these jobs won’t appear on any invoices. In the job details, there is an option to define the job as non-billable. But this functionality is especially useful when you have a big job for a client (which has to be invoiced as one job) but you need to outsource it to more than one supplier. In this case, you first have to create the normal, billable job for the client (as you would to for any other job). Then, in the same group (see our article about the grouping functionality: http://help.lsp.expert/groups-projects/how-can-i-create-a-groupproject-containing-several-jobs), you create one job for every outsourcing you need to do for this job. So one job for every supplier, each with the correct number of words. And you define these jobs as "non-billable". When the time will come to send your invoice to your client, you can simply invoice the job as usual. You can even accelerate your invoicing process even more by simply selecting all the jobs from your list (all of them!) and invoice everything in a click using the “Invoice selected jobs” button. 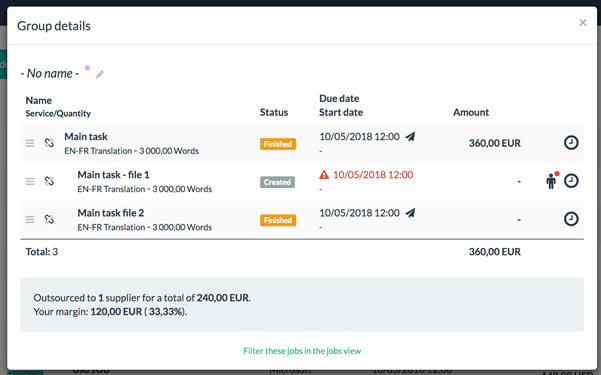 Thanks to the « non-billable » option, the system will know which jobs don’t have to be included in the invoice. You can click on the dot in front of the group items (in your list of jobs) to see the group details. You can see that the non-billable jobs have no amount on the right, but you see (below the pop-up) that you have the outsourcing details of your big job.